We spent the better part of the first 2 weeks here trying to figure out how to furnish the place. Let me just tell you right now that if you think ordering furniture from IKEA Online will be cheaper and more convenient than going by bus to IKEA Freiburg, you’re wrong. Yeah, I know. We were confused by that, too, but we did eventually figure that out. As a side note, if you want to get to IKEA, you can catch the 11 bus in front of the Convention Center, and it comes at :21 and :51 of every hour during the work day. It will take you about 24 minutes to get there, and it’s 2,20€ per ride. But, no, I’ve not been to IKEA 8 times since we moved in 4 weeks ago. Anyway, we have the essentials: a bed, a wardrobe (complete with Narnia), a dresser (graciously left to us by the former tenant), a pull-out sofa for all of the visitors we’d better get in the next 9 months, a table, and 2 chairs. We do love that we got to pick out all of the furniture, so the place not only feels homey, but it’s all new, too. 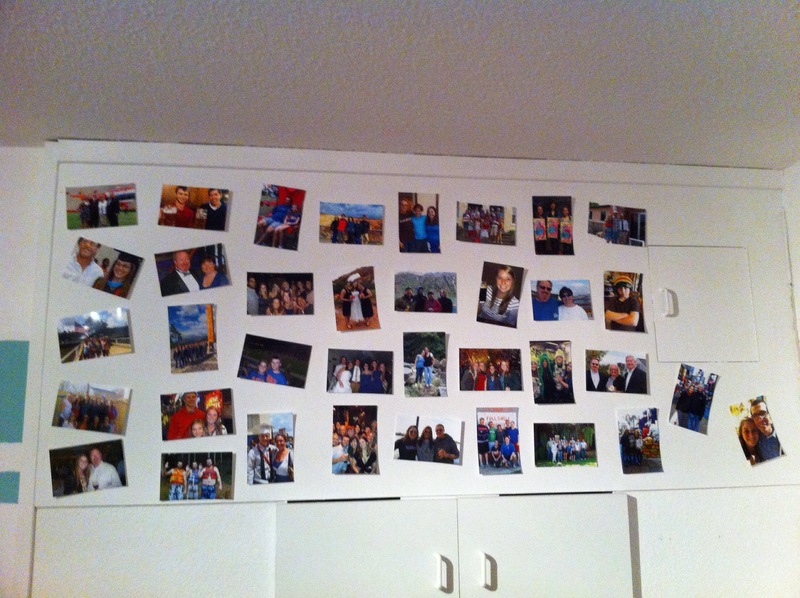 Our sofa and wardrobe with more photos lining the top of the wall! Despite what I’ve made it sound like, we did NOT spend the entire month going to IKEA and trying to get Wifi installed (just, like, 3/4 of the month.) We’ve picked up some classes at inlingua (the language school we freelance at), so we’re both teaching (a whopping) 4 hours of work per week (each). We travel to businesses in and around Freiburg and teach English to employees who need it for their job. It’s actually really fun, and we have different levels to teach, which keeps it really interesting. I’ve got a 1B class (probably the equivalent of my Spanish), and then a 3A class, which is practically fluent, so we just talk about business or anything that interests them, and I mostly just correct their use of the future simple and continuous tenses. Sorry, I just slipped into nerd mode for a second, but I’m back. Anyway, we’re hoping to pick up several more classes each, so keep your fingers crossed for us! You have so much more room for activities!! Awww I love the picture wall! And I have enough trouble figuring out how to get out of the IKEA parking garage here, so actually taking public transport there is, like, heroic.